This is my wild game riff of the traditional mushroom burger — you know, the one with lots of sauteed mushrooms, onions and Swiss cheese on top? You’ve seen it on the menu in pretty much every burger joint in America. I prefer my burgers grilled, but you can cook your meat any way you’d like. 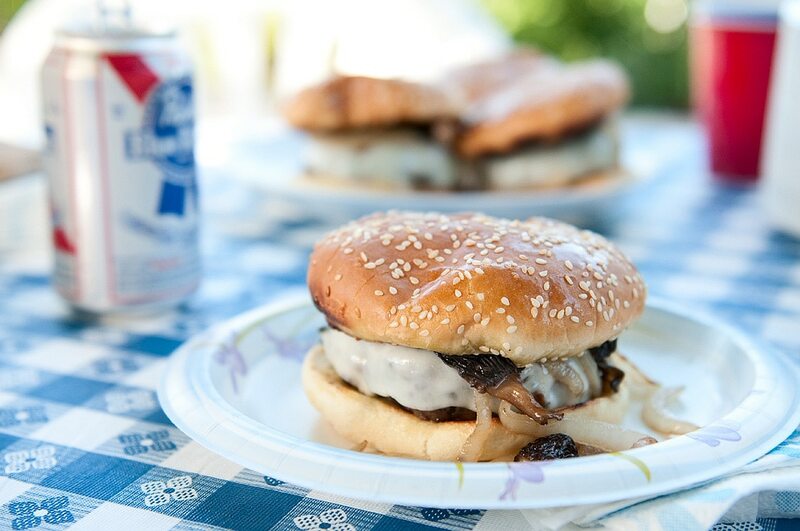 I also prefer my burgers without pretense; thus the Pabst Blue Ribbon in a can sitting behind the burger. Then I was informed that, due to about some odd wrinkle in the time-space continuum, Pabst has become associated with hipsters. Huh?! Damnit, this was a workingman’s beer I grew up with; there was a Pabst brewery near my house in Jersey growing up. I refuse to wear skinny jeans and talk endlessly about how I knew this obscure band waaay before you did while drinking my Pabst. 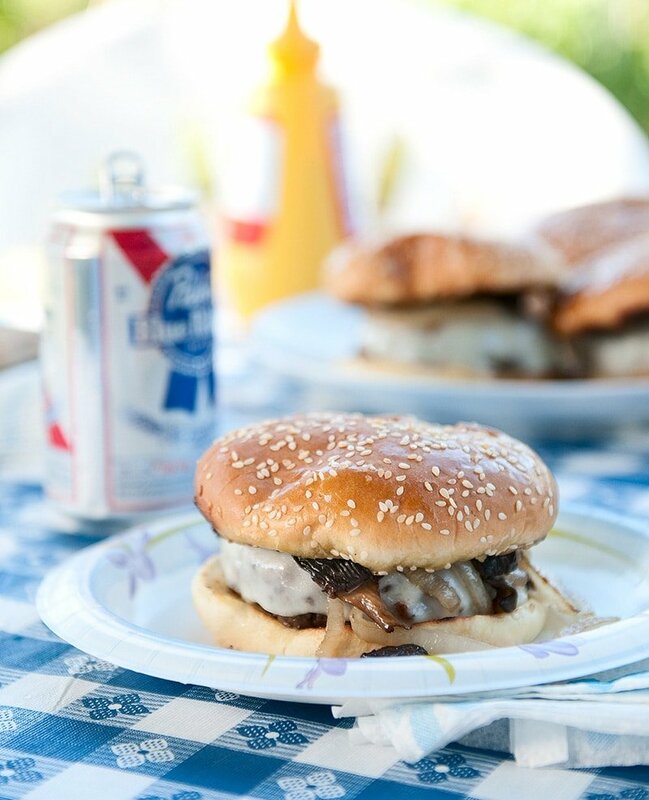 But I will continue to drink Pabst on hot days, with a hamburger. This burger, in fact. It’s everything you want in a mushroom burger, only wild. This is a game version of the classic mushroom burger you see in hamburger joints all over the country: A big ole' meat patty, topped with grilled or sauteed onions and mushrooms, served with cheese, usually Swiss. Mustard is the traditional accompaniment here. 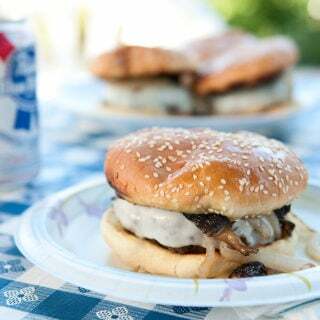 What makes my version of a mushroom burger different -- other than using venison and wild mushrooms -- is that I add ground, dried mushrooms into the meat mixture to get a stronger mushroom flavor. Use any wild or domestic mushrooms, and you don't have to use the same one in the meat mix as you do in the saute. Grind the dried mushrooms to a powder in a coffee grinder. This may take a bit of doing, and if you have any big pieces left over you can use them for something else, or you can add them to the meat mix and let the meat sit in the fridge for several hours -- the moisture from the meat will rehydrate the pieces and you won't then be crunching on them in the burger. Mix into the meat the dried mushroom powder, celery seed and thyme. It doesn't have to be uniformly mixed in. Shape the meat into patties. 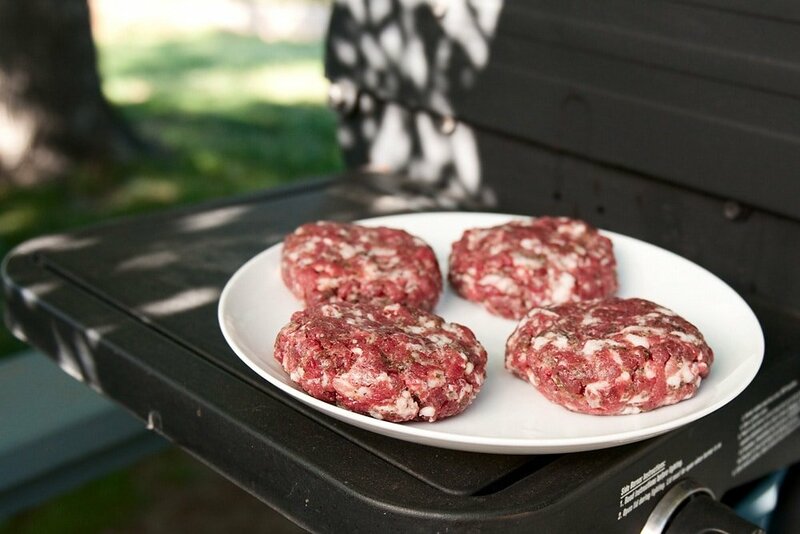 When you do this, don't overwork your meat or your hamburgers will become tough and chewy. Crumbly is better than tough, to my mind. Also, press a little indentation into the center of each patty: This helps the patty keep its shape once cooked, because when meat cooks it tightens up and will turn into a ball shape if you don't have that indentation. Get a large saute pan hot over high heat and add the mushrooms. Shake the pan frequently so they don't all stick, and cook the mushrooms until they release their water, about 2 to 4 minutes. As soon as the water has mostly bubbled away, add the olive oil, some salt and the sliced onion and saute until everything has nicely browned, about 6 to 8 minutes. Turn off the heat and set aside. Salt your burgers and grill them (or cook them in any other way) to your liking. I like mine medium, so I grill over medium-high heat about 4 to 6 minutes per side. I only flip my burgers once. When you flip the burger, let it cook about halfway on the second side before slapping a slice of cheese on the patty. Close the grill lid to let it melt. To build the burger, toast the buns if you want first. Paint with mustard or whatever, then lay down a patty. Top with the mushrooms and onions and have at it! Serve with a salad and a cold beer. 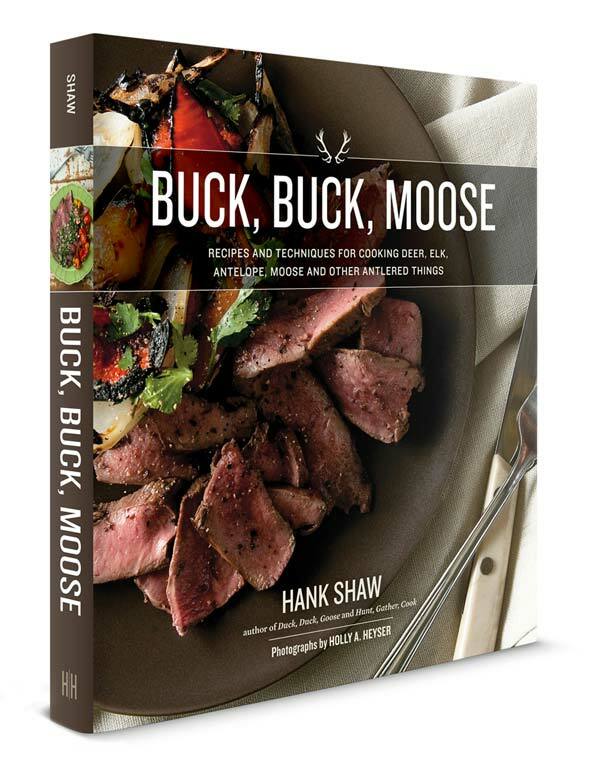 Making this recipe again today, with moose and trying a tip someone posted about using 10% beef trim instead of unrendered fat (pork or any). I am not opposed to using the unrendered fat, but the first time I bought some, it came in a chunk from the butcher (instead of ground) and it was very difficult and time consuming to incorporate, and because I had huge chunks of fat in the patty, it resulted in an overly greasy burger that still had delicious flavour. I think beef fat or trim is a good alternative to those who don’t eat pork or try to avoid it. I can’t wait for dinner. I know I talk too much, but the beef trim did work wonders. Perfect grease to meat ratio. Hank: Is it okay if the burgers still run a little blood after they are cooked? I suppose I just need to eat them right away or make sure they reached the right temperature?